Santa Monica Bar Association Annual Fall Dinner — Oct. 16, 2012 – Web Presence Esq. WebPresence, Esq. is delighted to sponsor the upcoming Santa Monica Bar Association Annual Fall Dinner. This will be a great opportunity to dine and connect with fellow Los Angeles lawyers and legal professionals in a relaxed setting outside of the courtroom. Additionally, the SMBA will be introducing the new SMBA Board of Trustees. The event will take place at the gorgeous Shutters on the Beach, in Santa Monica. For more information on the event, including how to purchase tickets, please do not hesitate to contact us. 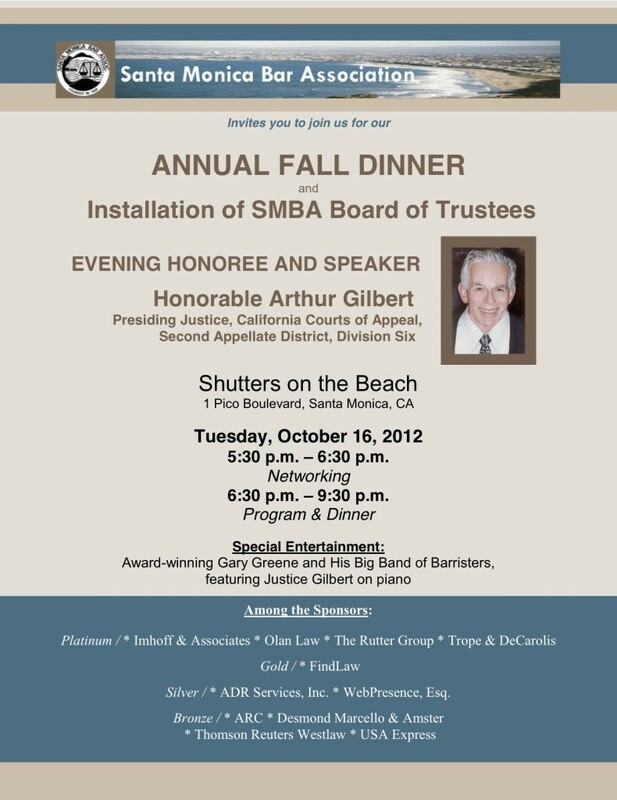 You can also click on this link to register: SMBA Annual Fall Dinner.